Netflix smash hit Orange Is The New Black has dropped a new trailer, picking straight up from where the fourth season left us. Taylor Schilling, Laura Prepon, Laverne Cox, Kate Mulgrew, Natasha Lyonne and more return to the streaming service for the fifth season later this year. 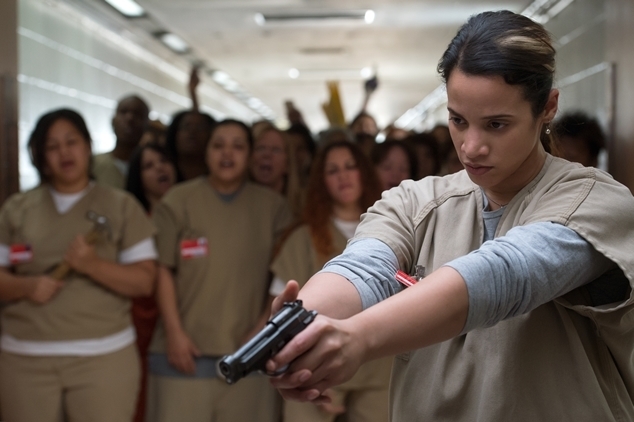 Daya (Dascha Polanco) can be seen aiming a gun at a guard’s head while many of the other inmates encircle her, chanting for her to fire. Piper and Alex approach, hoping to avoid drama, and run away from the mob just before a gun shot is heard. Does Daya shoot the guard? Or perhaps another inmate? Will it lead to a full scale riot at Litchfield? Watch the trailer below. Orange Is The New Black Season 5 hits Netflix on June 9th.